Tristan und Isolde has been called opera’s ultimate love story, so Seattle Opera and the Maxwell Hotel want to help you have the ultimate date night! 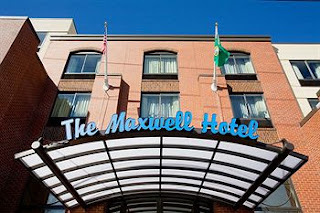 The Maxwell Hotel opened in March in Lower Queen Anne. It's located just one block away from Seattle Center -- you can't miss it, it's got a big pineapple on the front! (Its slogan: "Meet me at the Pineapple.") In addition to all the regular hotel amenities, the Maxwell has some unique offerings, like complimentary bike rentals for guests. The Tristan und Isolde Opening Night package includes: a complimentary German wine tasting at the hotel in the afternoon (we’ll make sure none of them are love potions! ), a 3-course dinner at McCaw Hall’s Prelude Café, tickets to the pre-performance lecture, two great orchestra seats to the opening night performance of Tristan, a coupon for 10% off at Seattle Opera’s gift shop, and a one-night stay at the Maxwell Hotel. So you'll get a fabulous date night and you'll save over $150! You can find more details here.